Back in the days we enjoyed playing all kinds of breakout/arkanoid video games. Today, there are many developers that tried to create similar arcade games, but few of them really succeeded. We’ve chosen one of the best cross-platform games that are made with retro gameplay, it is called Brick Breaker 3D. This addictive, challenging and fun game is designed with 3D graphics, neon glows, great effects and engaging sounds and sound effects. The gameplay of the Brick Breaker 3D game is one of the coolest we’ve ever played. At first you may think it is easy to master, but as you advance it will get more and more difficult. Your main goal is to break all of the bricks with your own fire ball and collect the money by doing that. 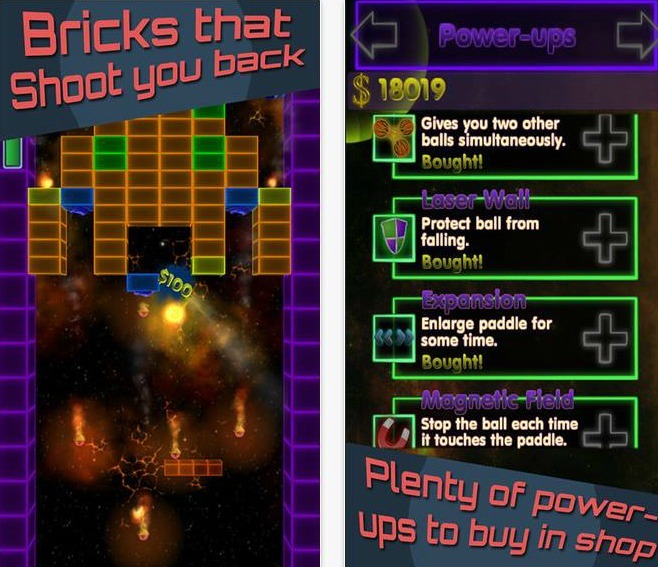 The game features different kinds of bricks, for example bricks that move, bricks that shoot you back, bricks that turn off the laser barrier, bricks that stand still and die on one hit, etc. Also, you will have the opportunity to buy helpful power-ups from the game’s store. You control your fire ball with the paddle that you move just by dragging your finger across the screen. If you want to enjoy a retro gameplay, designed with improved and fantastic 3D visuals, download Brick Breaker and win as many levels as you can. Get it now for free from the App Store or from Google Play.